March 14, 2012, Barrington, NJ USA — Edmund Optics® (EO), the premier provider of optical components, introduces new TECHSPEC® High Contrast Plastic Linear Polarizers. These versatile polarizers are ideal for a wide variety of imaging applications. Offered in multiple sizes, TECHSPEC High Contrast Plastic Linear Polarizers feature an excellent extinction ratio. 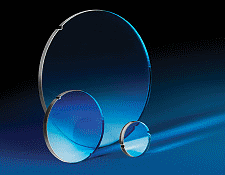 The polarizers offer outstanding high transmission of unpolarized light from 400-700 nm. TECHSPEC High Contrast Plastic Linear Polarizers provide increased durability when compared to polarizing film. TECHSPEC High Contrast Plastic Linear Polarizers are ideally suited for a broad range of imaging applications. Eliminating glare is critical in imaging applications where high contrast is essential, including edge detection and when used with cameras employing small aperture lenses. TECHSPEC High Contrast Plastic Linear Polarizers utilize PVA film technology. When unpolarized light enters a linear polarizer, light is that is polarized perpendicular to the polarization axis is absorbed, while light parallel to the polarization axis is transmitted. TECHSPEC High Contrast Plastic Linear Polarizers use a proprietary stretched PVA film to create the polarization axis. For increased protection and excellent durability, the PVA film is laminated between two plastic plates. The polarizers are available, unmounted, in a wide range of sizes, from 12.5 mm up to 300 mm diameters, from 50 x 50 mm up to 300 x 300 mm, as well as 500 x 600 and 900 x 600 mm sizes. TECHSPEC High Contrast Plastic Linear Polarizers are in-stock and available for immediate delivery for fast turnaround and excellent value.